Curiouser and curiouser. The Daily News recently ran a story detailing how deeply the City's Law Department fought against the historic settlement of the Central Park 5 lawsuit. (Here). The News references an internal report issued by the lawyers which argued that the aggregate settlement ought to be capped at $15 million, and that a trial was quite winnable. The thrust of the story was that the lawyers thought the eventual settlement of $41 million was grossly overvalued and unnecessary. Today, however, Mayor de Blasio, put the responsibility for the settlement squarely on Zachary Carter, the head of the Law Department. (Here). De Blasio flatly denied knowing the amount prior to the agreement, playing any role in the process, or hearing any objections. It's a tough sell and reflects poorly on the Mayor. The backstory is simple: Bill de Blasio's 2013 campaign was driven in no small part by attacking basic NYPD practices and the way in which Mayor Bloomberg and the City's Law Department was defending these practices. As an outsider, de Blasio blasted these municipal policies and promised to reverse course in several high-profile matters, including the Central Park 5 suit. And then he won. The thing is, overseeing law enforcement and legal departments when you're in charge requires an entirely different set of priorities and concerns than cherry picking issues for campaign rhetoric. 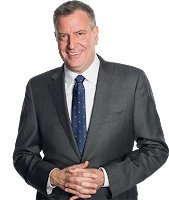 As Mayor, de Blasio is our chief administrator, whose main tasks include keeping the streets safe, by and from police, and keeping legal expenses down. Further complicating things is the mindset of many NYPD supporters, whose viewpoint seems be, either you are entirely for us on every point, or you are against us. For many, like the police unions' leadership, there is no nuance, no shading, no gray. You are all in or all out. None of this was helped by his public statements to the effect that he had no intention of allowing the Central Park 5 case to go trial. While this may be a worthy sentiment, it's a terrible negotiating tactic. As previously remarked, once you tell a salesman that you must, absolutely must, have whatever he is selling, you cannot expect to get a good price. So the City paid $41 million, or a million a year to five men who de Blasio's own NYPD and legal department felt strongly did not deserve it. Calling their conviction and incarceration an injustice, de Blasio rubbed open the wounds inflicted on the NYPD by former DA Robert Morgenthau when he first moved to vacate their convictions. He then paid them what is an historic amount of money. As the lawyers and cops who fought the case for the past decade rebelled publicly, de Blasio quickly passed the buck, dumping the decision on Zach Carter, as though his office had any real say in the matter, as though it was Zach Carter's decision to settle this case. Call it for what it is: shameful backpedalling. This may sound as though I too am opposed to the settlement. I am not. Reflexively, I support all such outcomes in civil rights cases, even when, as is the case here, I am not fully aware of all the underlying details and am not as convinced as others of the absolute righteousness of the case. Yet, it is the selective nature of the settlement is upsetting. Outsiders may believe that de Blasio is truly seeking to remedy the City's past wrongs by paying off the victims. It is most definitely not. Yes, the CP 5 were paid, and paid handsomely. So too was Jabbar Collins, although he certainly was deserving. But what of all the others? There is no shortage of cases where police, alone or with able assistance from prosecutors, railroaded innocent folks, causing them to sit for months or years in jail. For these folks, there is no easy justice, no compensation, no public vindication. For these cases, the City is litigating as though it is business as usual. Which I get, they have the public fisc to protect, and if they would rather allow the misconduct to continue and fight it in the courts, rather than seek meaningful systemic change, well, that's de Blasio's right as chief executive officer. However, own the decisions you make. In this case, the Mayor eased into office by promising this settlement. Zach Carter may have executed the paperwork, but it is beyond implausible to believe that he would settle this case (of all cases) for this sort of money without City Hall's blessing. Shame on de Blasio for ducking responsibility for the decision, and shame on him for making a mockery of the notion that he would bring justice to those wrongly jailed or impose real reform on the NYPD. De Blasio's deflection is a craven political move that betrays a cowardice that I hardly expected to see, and an abandonment of the moral high ground which, however impractical for purposes of governing, was the Mayor's saving grace.